§ A-1 Location and composition of district. § A-3 Residence District Guidelines. § A-4 Supplemental guidelines for specific Residence District properties. § A-5 Central Business District guidelines. § A-6 Supplemental guidelines for specific Central Business District properties. The Amagansett Historic District contains a mix of historic houses, barns, community buildings and commercial buildings in a rural setting. The essential character of the Historic District is established by the 30 farmhouses dating from the 18th Century through the 19th Century when Amagansett matured as a thriving agrarian community. The continuum of these farmhouses on either side of Main Street gives the Historic District much of its cohesive character. The remaining barns and agricultural land greatly enhance the rural setting of the farmhouses and maintain the connection with Amagansett's agrarian past. The community buildings and the historic commercial buildings occur at intervals up and down Main Street. These buildings are largely compatible with the neighboring farmhouses and contribute to the overall harmonious character of the Historic District. Promote a harmonious and cohesive character for all of Main Street. Maintain and enhance the elements that contribute to the overall setting of the historic houses: open front yards and traditional fences along the street. Maintain the architectural integrity of the historic houses, especially of the front facades and other components visible from the street. Allow additions and other changes to rear walls and in appropriate ways to side walls to allow the historic houses to be adapted to changing needs and lifestyles. Maintain the architectural integrity of the barns and the integrity of their setting. Maintain the architectural integrity of the historic commercial buildings. Retain the rural and informal character of the Central Business District characterized by a mix of building types, by a significant amount of open space and by spaces between buildings. Guide redevelopment of nonhistoric buildings in the Central Business District to increase compatibility with neighboring historic commercial and residential buildings and with the character of the Historic District in general. These guidelines apply to all properties within the Residence District of the Amagansett Historic District. These include properties in the Limited Business Overlay District. Maintain and enhance the elements that contribute to the overall setting of the historic residences: open front yards and traditional fences along the street. Maintain the architectural integrity of the historic residences, especially of the front facades and other components visible from the street. Allow additions and other changes to rear walls and in appropriate ways to side walls to allow the historic residences to be adapted to changing needs and lifestyles. Summary of work that is exempt from review. Picket fences and split-rail fences less than four feet high. Any work to the rear wall of a residence that does not require a building permit. All work listed above that is exempt for single-family residences. Site work. The Amagansett Historic District has an open, rural setting which allows each building to contribute to the setting of its neighbors and to the overall setting of the Historic District. The intent of these guidelines is to maintain the elements that contribute to this setting including open front yards and traditional fences. Any new elements introduced should be compatible with this open and rural character and not detract from the integrity of setting of any property in the district. Work in the back yard of a single-family residence is exempt from review. All work in the back yard of a single-family residence is exempt from review, except for an addition to the residence. Fences and walls. The intent is to retain the existing character of the Historic District with its mix of traditional fence types. The Amagansett Historic District has a variety of traditional fences. There is about an equal number of picket fences and split-rail fences and one horizontal-board fence. These fences delineate boundaries while maintaining an open character to the front yards. A picket fence that is less than four feet in height or a split-rail fence with two rails is exempt from review for a single-family residence or a church. A chain-link fence is inappropriate along any property line. Berms or retaining walls would detract from the setting of the historic buildings. A new driveway or parking area should not detract from the setting of the Historic District. 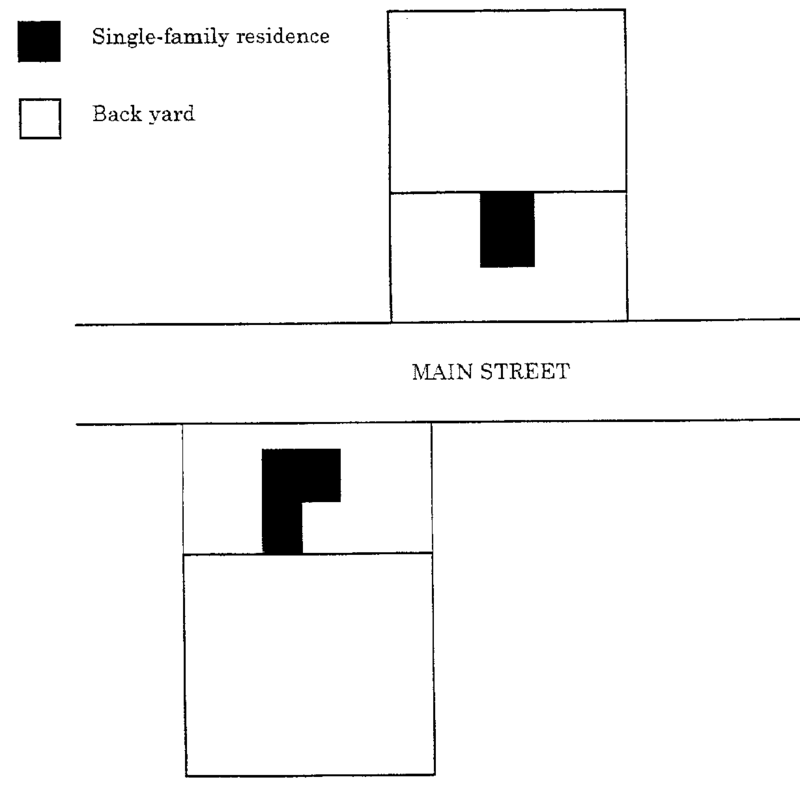 Driveways are exempt from review for a single-family residence. Tennis courts, swimming pools, decks and terraces. A new tennis court, swimming pool, deck or terrace should not detract from the setting of the historic buildings. A tennis court, swimming pool, deck or terrace and associated fencing located in the back yard of a single-family residence is exempt from review. The most appropriate fencing would not extend forward of the rear wall of the residence. To the extent that fencing extends forward of the back yard, it is not exempt from review. Swimming pools and tennis courts should be located to the rear of the residence. Decks and terraces will be reviewed for their location and impact on the setting and architectural integrity of a historic building and the setting of other properties in the district. Exterior lighting is exempt from review for a single-family residence or a church. Commercial properties are subject to the guidelines for exterior lighting found in the Central Business District Guidelines (§ A-5). These guidelines refer primarily to the 27 historic residences which establish the essential character of this area of the Amagansett Historic District. These guidelines also generally apply to other buildings in this district which include churches and commercial buildings. Additional guidelines that address the special character of some of these properties are found in supplemental guidelines for specific Residence District properties (§ A-4). The intent of these guidelines is to maintain the architectural integrity of the historic buildings, especially of the front facades and of other components visible from the street. The guidelines allow changes that are compatible with the character of a historic property. Wall material. The intent is to retain appropriate exterior materials, especially wood shingles. Wood-shingled exteriors predominate on Main Street and make a major contribution to the cohesive character of the Historic District. Two historic residences retain their original clapboard siding. Historic buildings with wood shingle walls or clapboard walls should retain this treatment. Roof material is not a critical factor in the Historic District. Gutters and leaders are not a critical factor in the Historic District. Doorways. The intent is to retain original front doorways that contribute to the historic character of a building. On many of the historic residences, the primary decorative emphasis is found at the front doorway. The elaborate doorways of the Greek Revival and Italianate-period houses make an especially strong contribution to the character of the Historic District. Installing a storm/screen door at any doorway is exempt from review for a single-family residence or a church. Windows. The intent is to retain original windows that contribute to the historic character of a building, especially on the front facade. A large number of the historic residences retain the original windows and window sash. These are primarily the six-light sash of the Greek Revival and Italianate-period houses and the two-light sash of the Victorian era houses. These intact windows make a significant contribution to the architectural character and to the sense of authenticity of the Historic District. For any request to replace window components the Architectural Review Board will consider the contribution the existing windows make to the historic character of the building. Replacement components for important windows, especially those on the front facade, should match the material, configuration and dimensions of the original. Installing a skylight requires review. No skylight should be installed on the front roof slope of a building. Front porches. The intent is to retain original porches that contribute to the historic character of a building. Thirteen historic residences on Main Street which date from 1870 to 1913 retain their original front porches. These porches are important aspects of the historic and architectural character of these houses. Removing, replacing or installing a porch or porch posts, columns, balustrades, brackets and other important components requires review. Deteriorated components should be replaced in kind. Paint. The historic residences on Main Street are about evenly divided between unpainted wood-shingle siding and painted-shingle or clapboard siding. White is the most common siding and trim color. These two simple color schemes (natural shingles with white trim and white siding with white trim) contribute to the traditional and rural character of Main Street. Painting or staining is exempt from review for a single-family residence or a church. Commercial properties are subject to the guidelines for paint found in the Central Business District guidelines (§ A-5). Flexibility is required in reviewing additions and alterations to rear walls and to secondary side walls of houses where installation of doors, windows and additions with more glazing than found in the historic house can be expected. Existing additions in the Historic District may serve as precedents for proposed new additions. Many of the historic residences have rear additions which are stepped back from the side walls and smaller in scale than the original house. Some houses have small-scale additions set back on a side wall. The intent of review of these nonhistoric residences is to see that any changes do not detract from the setting of a historic building and do not diminish the character of the Historic District. Therefore, any proposed changes to a nonhistoric building should be judged for their compatibility with neighboring historic buildings and with the character of the street and district in general. Because most work on a nonhistoric residence would have little or no effect on the Historic District, these guidelines attempt to make the process as streamlined as possible. Any work to a nonhistoric residence which does not require a building permit is exempt from review. Any addition or alteration of a nonhistoric residence may be in the style of that residence. For example, an addition to the flat-roofed house at 441 Montauk Highway may be in the same modern style. Contemporary design. The Amagansett Historic District is a complex entity. It reflects a range of historical periods and contains many different building types. Contemporary designs should fit into the existing context while contributing to the sense of evolution and the complexity of the Historic District. Contemporary designs that respond to the architectural traditions and character of the Historic District are encouraged. Contemporary designs should relate to the forms, materials, details and other characteristics of the historic buildings, but are not required to imitate the historic styles of the existing buildings. Accessory buildings. Any accessory building, such as a garage, shed and pool house, located in the back yard of a single-family residence is exempt from review. Placement and plans for accessory buildings at any other location will be reviewed. Generally these buildings should be compatible with the main building, its setting and with neighboring buildings. Principal buildings. New buildings should be compatible with the historic buildings and with the character of the Historic District. Section 255-7-60B of the East Hampton Town Code provides criteria for judging the compatibility of new construction. These criteria, which are amplified below, define the basic design elements which establish the character of the Historic District. The design elements of a new building should be in harmony with the same elements of the surrounding historic buildings. New buildings should be sited on their lots corresponding to the setbacks of adjacent historic buildings. The front facade of a new building should face the street. Rhythm of spacing of buildings. The rhythm of buildings and the spaces between which characterize the district should be maintained by the siting of a new building on its lot. Scale. The scale of a new building and its features should be in harmony with the scale of the historic residences in the district. Roof form. New buildings should have a roof form typical of that of surrounding historic buildings. On Main Street gable roofs with unbroken slopes predominate. The roof slope should be within the range established by the historic roofs. Materials. The materials of a new building should be in harmony with the materials of the historic residences. Wood shingles or clapboards are appropriate siding materials. The Architectural Review Board shall consider the historic and architectural significance of the building, the contribution the building makes to the Historic District and the impact of its removal on the character of the district. The Architectural Review Board may require adequate documentation of a historic building through photographs and measured drawings as a condition of approval when there is no alternative but demolition. Before approval can be granted to demolish a building, the Architectural Review Board shall require plans for proposed new construction or other use of the site be submitted and approved. Relocation. The intent is to retain the historic buildings on their original sites. In the Amagansett Historic District each historic building contributes to the setting of the neighboring buildings and together they establish the larger setting of the Historic District. The Architectural Review Board will consider the historic and architectural significance of the building, the contribution the building makes to the Historic District on its existing site and the impact of its relocation on the character of the district. Before approval can be granted to relocate a building, the Architectural Review Board shall require plans for proposed new construction or other use of the site be submitted and approved. Flag lots. The Residence District of the Amagansett Historic District includes the access strips to seven flag lots. The main portion of these lots and the buildings on them are not in the district. The owners of these access strips are required to submit an application only for any fence, wall or gate proposed within the designated access strip. The above Residence District guidelines apply to all properties in the residence zone. Since many of these guidelines apply most directly to houses, some additional guidelines are appropriate for the commercial and community buildings in the Residence District. 303 Main Street, Commercial Building. A small-scale commercial building has been at this site since 1860. The existing building is compatible with the character of the district in scale, massing, materials and roof form. Any alterations or redevelopment should increase compatibility with neighboring historic residences and should maintain their setting. 367 and 375 Main Street, Amagansett Farmer's Market. The open space and agricultural land of these properties makes a very important contribution to the setting of historic residences in the area and of the Historic District as a whole. The small-scale commercial building has a minimal impact on the rural and agricultural setting of these two properties. Any alterations, redevelopment or new construction should be compatible with the character of neighboring historic residences and should, as far as possible, maintain the contribution these properties make to the setting of the historic residences and of the Historic District in general. The setback, massing, roof form and materials of this commercial building are in harmony with the character of the Historic District. The significant open space around the building helps to mitigate its large scale. Any alterations or redevelopment should enhance compatibility with neighboring historic residences. Long Island Rail Road Freight Depot. The 1895 Amagansett Freight Depot is a rare intact example of this building type. Distinguishing features include the brick walls; hip roof with wide, bracketed eaves; and the original arched door and window openings. The architectural integrity of the 1895 Freight Depot should be maintained. This intact church makes an important contribution to the Historic District. The architectural integrity of St. Thomas' Chapel and its open setting should be maintained. Alterations, additions or redevelopment of the rectory should be compatible with the Chapel. Modifications deemed liturgically necessary should be readily accommodated per the requirements of the Church. 286 Main Street, St. Peter the Apostle Roman Catholic Church. This church with its small-scale, modest design, shingled exterior and open setting contributes to the rural character of the Historic District. It is understood that because of the small size of this church and a growing congregation, building a new church or an addition to the existing church may some day be necessary. Modifications deemed liturgically necessary should be readily accommodated per the requirements of the parish. Any alterations or additions should be compatible with the character of the church, neighboring residences and their setting. 350 Main Street, United Presbyterian Church. This is one of the most significant buildings in the Historic District and it retains many original exterior features. The architectural integrity of the church should be maintained. These guidelines apply to all properties within the Central Business District of the Amagansett Historic District. The Central Business District contains a mix of both historic and recent commercial buildings as well as some of the most important historic residential and agricultural properties in the Amagansett Historic District. Maintaining the architectural integrity of the historic houses and barns and the integrity of their setting is critical to maintaining the overall cohesive character of the Historic District. Commercial buildings began to be interspersed with the residences on Main Street toward the end of the 19th Century. This pattern remains part of the character of Main Street today. The historic commercial buildings represent a variety of types, materials and periods which, along with the mix of historic residences, contributes to the rural and informal character of the Central Business District. Maintaining the architectural integrity of the historic commercial buildings is essential to preserve this special character of the Amagansett business district. More recently commercial development has been concentrated on the north side of Main Street in the vicinity of the town parking lot; the compatibility of this row of commercial buildings with other areas of Main Street is a critical factor in maintaining the integrity of the Historic District. Retain the architectural integrity and the setting of the historic houses and the historic barns. Retain the rural and informal character of the Central Business. District characterized by a mix of building types, by a significant amount of open space and by spaces between buildings. Guide redevelopment of nonhistoric buildings to increase compatibility with neighboring historic commercial and residential buildings and with the character of the Historic District in general. Exterior lighting should be appropriate to the rural character of the Historic District and compatible with the residential areas of the district. Lighting of signs, entrances and of surrounding areas is subject to review. Light directed on signs should spill beyond the borders of the sign as little as possible. Incandescent lamps and full-spectrum fluorescent lamps are the most appropriate light sources. Internally illuminated signs are not appropriate. Awnings should be appropriate to the rural character of the Historic District. Traditional fabric awnings with a straight front and a straight sloping canopy with or without a valence are appropriate. Paint. Consistency in exterior finishes can enhance the compatibility between commercial and residential buildings and between recent commercial buildings and historic commercial buildings. Like the historic houses, either natural wood shingles or a white-painted exterior predominate among the historic commercial buildings. Colors of historic buildings should be appropriate to their period and style, taking into account the significance of their evolution over time. Historic buildings with either natural-shingle siding or with shingle or clapboard siding painted white should retain those treatments. Natural-shingle siding or siding painted white along with white trim are appropriate finishes. Other colors used should harmonize with the colors of the historic buildings and with the setting of the Historic District. The historic commercial buildings on Main Street make a major contribution to the cohesive character of the Historic District. The general small scale of these buildings, the wood facades, the residential second-floor windows, and their siting as separate individual buildings all contribute to a rural and informal character that is compatible with the character of the residential area of Main Street. Original features of the historic commercial buildings should be retained, including overall design; original materials of the front facade; original storefronts; parapets and cornices; original details; and original upper-floor residential windows. Open spaces that contribute to their setting should also be maintained. Any alterations should not remove or obscure important original features and should be compatible with the historic character of the building. Additional guidelines for some properties are found in the supplemental guidelines for specific Central Business District properties (§ A-6). Nonhistoric buildings and new construction. These guidelines apply to alteration or redevelopment of nonhistoric buildings and to new construction. Buildings constructed after 1950 are classified as nonhistoric buildings. The alteration or redevelopment of nonhistoric buildings could have a significant impact on the character of the Historic District. New commercial buildings may also be constructed. Existing features of nonhistoric buildings that are compatible with the Historic District should be maintained. Alterations, redevelopment and new construction should be compatible with the historic commercial buildings and with the character of the Historic District in general. Additional guidelines for some properties are found in the supplemental guidelines for specific Central Business District properties (§ A-6). Contemporary designs should relate to the forms, materials, details and other characteristics of the historic buildings but are not required to imitate the historic styles of the existing buildings. Rhythm of spacing of buildings. Historic commercial development is characterized by small-scale individual buildings, many of which are separated from others by significant open space. These characteristics contribute to the rural character of the Historic District. Alteration, redevelopment or new construction should enhance this characteristic of separate individual buildings. Alteration or redevelopment of buildings joined by a party wall should distinguish the building to avoid the appearance of a commercial block. Open spaces between buildings should be retained. Scale. Most of the historic commercial buildings, with the exception of the Nicholl's Livery Stable and the Amagansett Garage, have a scale similar to that of the historic houses. The scale of any new or redeveloped commercial building should be in harmony with the average scale of the historic commercial buildings. Second stories. The second stories of historic commercial buildings, with their residential windows, enhance their compatibility with the residential area of Main Street. Second stories with windows having the scale, proportion and arrangement of the windows of the historic houses are appropriate. Existing second stories and their residential windows should be retained with repairs and replacements in kind where necessary. Display windows. Most of the historic commercial buildings have display windows of a vertical, square, or slightly horizontal proportion. Display windows of the proportions of those in the historic commercial buildings are appropriate. Materials. Most of the historic commercial buildings have wood facades and wood exteriors predominate throughout the Historic District. Front facades of shingles or clapboards with wood trim and storefronts with wood display window frames and wood doors are appropriate. Existing wood facades and storefronts should be retained with repairs and replacements in kind where necessary. Building details. The historic commercial buildings, like the historic residences, have relatively plain exteriors. The restrained use of ornament is appropriate. The goal is to maintain the architectural integrity of these buildings and the integrity of their residential or agricultural setting. The guidelines found in the Residence District guidelines (§ A-3) also apply to these properties, unless superseded by guidelines in this section. Additional guidelines for these properties are found in the supplemental guidelines for specific Central Business District properties (§ A-6). The Architectural Review Board will consider the historic and architectural significance of the building, the contribution the building makes to the Historic District on its existing site, and the impact of its relocation on the character of the district. 129 Main Street, Miss Amelia's Cottage. This property is important both for the Cottage and for the large open space. This property and the Jonathan Schellinger Farm Complex to the east have the potential to greatly enhance the setting of one another. Maintain the architectural integrity of the Cottage and the Roy K. Lester Barn. Retain the open land between the Cottage and the Jonathan Schellinger Farm Complex properties. Jonathan Schellinger Farm Complex 137 Main Street, Jonathan Schellinger Barn and Black's Variety Store (The Tack Trunk) 145 Main Street, Jonathan Schellinger House and Shed. The two properties which contain the Jonathan Schellinger House and Barn comprise one of the most important components of the Amagansett Historic District. No other property represents Amagansett's agrarian past as does the Jonathan Schellinger Farm Complex. Maintain the architectural integrity of the house and barn. Maintain all original fabric of the shed, which may have been Samuel Schellinger's woodworking shop. Maintain the historic relationships between the buildings and between the buildings and their setting. Black's Variety Store, originally a rear addition to the Jonathan Schellinger House, was moved and converted into a store about 1922. This building represents the historic development of commercial properties on Main Street where small-scale buildings were located close to the street between residences. 161 Main Street, Erastus Barnes House (Steven Talkhouse). Although this early 19th Century dwelling has been altered it continues to make a contribution to the Historic District. Maintain the frame and exterior form of the original dwelling. Maintain the three original window openings at the second floor of the front wall. Maintain the features of the front addition that contribute to its appearance as an enclosed porch. Any alterations should enhance its character as an enclosed porch. Alterations to other additions should be compatible with the original dwelling. 171 Main Street, Bluff Road Life Saving Station (Outdoor). The 1880 station was moved to Main Street in 1902 and converted into a store. Although altered by the modern storefront addition, this building is significant as a life saving station and for its contribution to the rural and informal character of the business district. Maintain the frame and exterior form of the original life saving station. Maintain original exterior features including the wide eaves, bargeboards with scroll ends and brackets under the eaves. 215 Main Street, Amagansett Free Library. This 1790 house in a residential setting at the center of the most built-up section of the business district is a critical component of the Historic District. Maintain the architectural integrity of the house. Maintain the open setting between the house and the street and to either side of the original house. 249 Main Street, J. Mason Schellinger House (WEHM/WBEA). The roofline of this one-story cape was altered in the 1880s and the house was moved back from the street and turned 90° in the 1970s. It retains little integrity and makes a minor contribution compared to the other historic houses in the Central Business District. Maintain the frame of the original dwelling. Maintain residential features including the windows and front doorway of the 1880s renovation. Any alterations should enhance the residential character. 261 Main Street, George L. Baker House. This 1853 house retains a high level of integrity and is one of the important group of five intact Greek Revival and Italianate dwellings in the district which, along with the 1860 Presbyterian Church, represent Amagansett's maturity as a prosperous independent community. During this period houses were sited farther from the street allowing front yards, but the setback of this house is unusually great. A commercial use of this house could lead to a proposal to move the house toward the street in order to provide parking to the rear. This is one of the few houses in the Historic District that could be relocated on its lot without seriously diminishing its integrity of setting. Maintain the architectural integrity of the main house and of the west wing. Maintain the open setting between the house and the street. Locate any parking area behind the house. If the house were moved toward the street to meet parking requirements, the setback should be appropriate for its period and be in the range of setbacks of other houses of the 1850 - 1875 period on Main Street. As long as this property remains a single-family residence, all work that is exempt from review for a single-family residence [§ A-3B(1)] is exempt for this property. 11 Indian Wells Plain Highway Nicholl's Livery Stable. The Nicholl's Livery Stable is a rare surviving building type associated with the early Amagansett summer colony and has an outstanding level of architectural integrity. It is anticipated that adapting this building to a new use will require additional windows at the first floor and possibly new windows for the second floor. The west and south walls are the most significant character-defining facades of the livery stable; the ARB realizes flexibility is required in reviewing changes to the secondary north and east walls. Maintain the architectural integrity by retaining important features, including barn doors; hay loft doors; vertical-board siding; roof eaves; original windows, especially on the west and south walls; and the barn red exterior with white trim. Nonhistoric additions and altered windows may be removed from the building. Any site plan review should have the goal of opening up a view from Main Street. 130 Main Street, Mobil Station. The most significant feature of this property is the open space at the west end which provides the potential for Nicholl's Livery Stable to make a greater visual contribution to Main Street. Any changes should be reviewed to enhance compatibility with the Historic District. Any site plan review should have the goals of maintaining the open space west of the building, removing intrusions from that space and enhancing the visibility of Nicholl's Livery Stable from Main Street. 136 Main Street, Amagansett Garage. This circa 1920 automobile dealership and repair shop introduced a new building type to Main Street. Maintain the architectural integrity of the two-story main building. 154 Main Street, C.W. Rackett House and Amagansett Square. The front of the original 18th Century house faced west and the gable end faced the street. During the last quarter of the 19th Century, a new front doorway in the gable end and additions with porches gave the house a new "front" facing the street. The house represents the evolution of Main Street during the 19th Century and is particularly important for the intact porch on the west addition. Maintain the architectural integrity of the house by retaining historic features, including early shingle siding; early windows and sash; front doorway; porch; and white painted exterior. Maintain the open setting between the house and the street and the open space surrounding the house. Review any proposed changes to the more recent buildings at Amagansett Square to enhance compatibility with the setting of the historic house. The individual buildings should remain smaller in scale and secondary in all characteristics to the historic house.